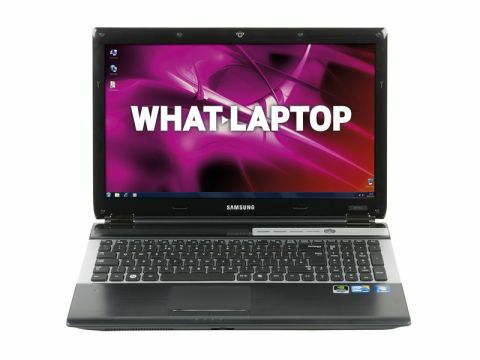 Samsung has impressed us over the past year, releasing a string of high-quality, yet affordable, consumer laptops. New to the range is the RF510, a powerful, usable and well-specified media centre that's easy to recommend. Built using a combination of glossy black plastic, silver faux-metallic flourishes and brushed gunmetal, the chassis has just as much style as the Acer Aspire 5943G. The panels feel firmly fixed and resilient to wear and tear, although the glossy lid is slightly prone to scratches. With its 15.6-inch screen and 2.6kg chassis, this laptop is really more suited to the home than a life on the road. This is highlighted by the 198-minute battery life. Nevertheless, this machine excels when used at home. The spacious, isolated-style keyboard responds firmly and accurately, and is ideal for working for long periods of time. The huge 89 x 53mm touchpad is equally usable, providing a vast canvas on which to navigate on-screen. The stunning 15.6-inch screen adds greatly to usability, offering striking brightness, colour and contrast. Whether viewing movies and photos, browsing the internet or working with office applications, images are consistently vibrant. As with the Acer Aspire 5943G and Fujitsu Lifebook S710, ample performance is provided by the dual-core Intel Core i5 540M processor. While very slightly outperformed by the Fujitsu, this is still a hugely powerful machine and more than capable of multi-tasking the most demanding of applications. Graphics are also excellent and are only marginally bettered by the Acer. The dedicated Nvidia GT 330M graphics card runs the latest games with ease, and makes light work of photo and video editing. The Samsung also features a Blu-ray drive for HD home entertainment. Where this machine beats its rivals is with its excellent features. The 640GB hard drive, for example, provides significantly more storage than most other laptops. It will easily hold vast collections of music, movies and photos, and provide enough storage for years to come. This is also one of the only laptops to offer high-speed connectivity in the form of USB 3.0 ports and Bluetooth 3.0 wireless access. One of the USB ports even utilises Sleep and Charge technology, so you can charge battery-powered devices when the laptop is switched off.